When friends and family visit us one of the first things that they typically comment on is all of the meats and cheeses out and on display in the grocery stores. To the American eye, seeing unrefrigerated meats and cheeses is a bit odd -- but, it's totally normal here. Particularly around the holidays we've noticed that the selection expands and special tables like this one pop up in most grocery stores. 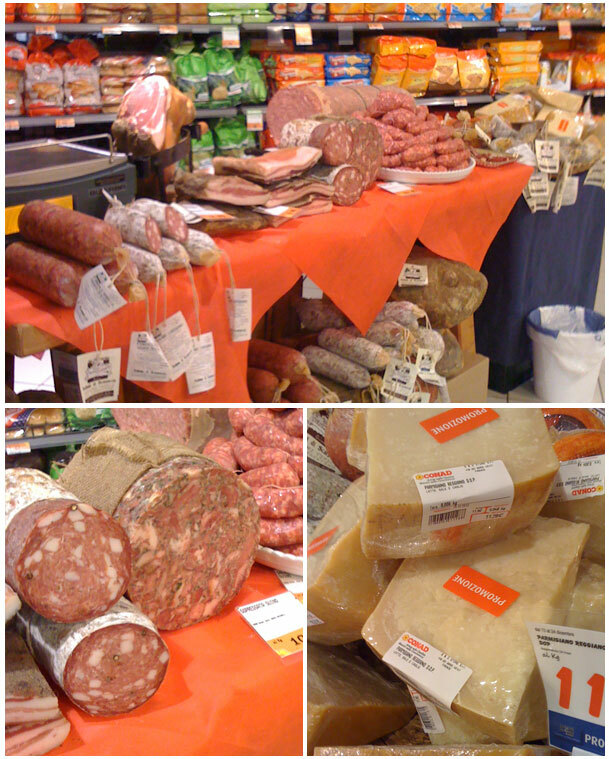 This photo is from the Conad grocery store near the Ponte Vecchio. In this market in particular it's fairly common to hear tourists exclaim, "This huge hunk of parmesan is only 11 euro!" Tourists, vegetarians and PETA supporters beware: this time of year we've also noticed an increase in the number of whole pig heads in the deli area. It is apparently some kind of holiday specialty to get meat cut from it...can anyone weigh in on this for us?